Summer is one of my favourite times of the year and I love all the lovely beauty launches that comes with it. 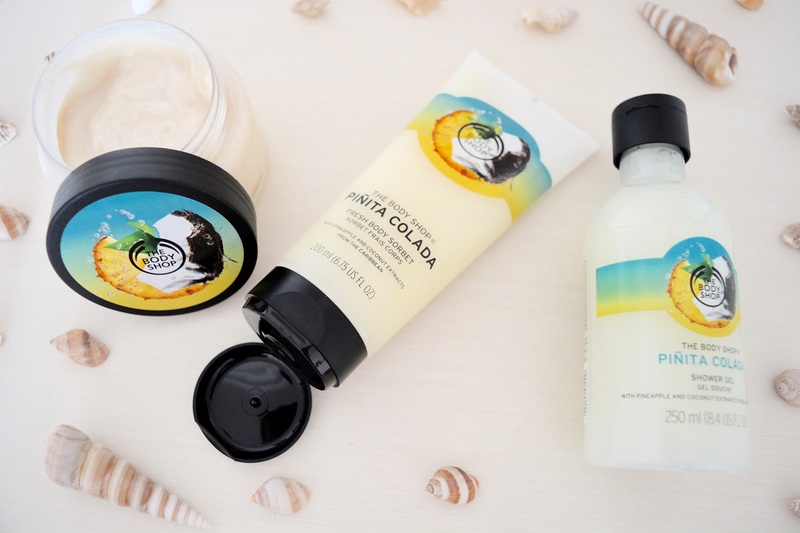 One of the best beauty launches I have seen the year is the Piñita Colada range by The Body Shop and it smells incredible! I'm a lover of all things cocktail related and I love that brands are increasingly using cocktails as scents for their new ranges! It's an absolutely genius idea and combines two of my favourite things: cocktails + beauty. The Piñita Colada range smells of a heavenly tropical paradise in the bottle, which instantly makes you feel like you are transported to an exotic beach. If only that was my reality and I was sat on a gorgeous beach with a Pina Colada in my hand, however, I will settle for the incredible products instead. The range consists of 4 products: a shower gel, body butter, body sorbet and body scrub, which vary in price from £5 to £15. When I went in the shop there was a fantastic deal on for 3 products for £20, so I obviously had to do it and it was a tough choice only picking 3 out of the 4, trust me! After much deliberating I opted to buy the shower gel, body sorbet and body scrub. The Piñita Colada Body Scrub (£15, 250ml) is perfect for getting rid of the winter lull and any impurities, so get your body summer ready with this delicious scrub. Containing real shredded coconut, the scrub will exfoliate skin and leave it feeling very soft. This has quickly become my favourite body scrub and I will definitely be stocking up on this before the end of the summer. It is perfectly paired with the Piñita Colada Shower Gel (£5, 250ml), which is a rich and refreshing formula. The Shower Gel lathers really well meaning you don't have to use a ton to feel refreshed or go through half the bottle in a day. So start your day the right way and soak up this divine tropical scent, a great uplifting way to start the day and the fragrance lingers on your skin even long after you've gotten out of the shower. And finally my favourite product in the range... the Piñita Colada Body Sorbet (£8, 200ml). This Body Sorbet is incredible and the scent is slightly stronger than the other two, so it stays on your skin all day long. The Body Shop Body Sorbets are perfect to keeping cool all summer and you can even put them in the fridge for an even cooler result. I have had two of the body sorbets before and I used them both up within months, they are amazing. It's a refreshing, lightweight and fruity product, which is a burst of summer and will liven up your day. The texture is incredibly light and different to any body care product you will ever try. The Body Sorbet is instantly absorbed into skin, leaving it feeling smooth and hydrated. I cannot even begin to describe how much I love the Piñita Colada range and how heavenly it smells! I'm pretty sure it is a limited edition collection so you better stock up fast before the range stops, as you definitely do not want to miss out on it!